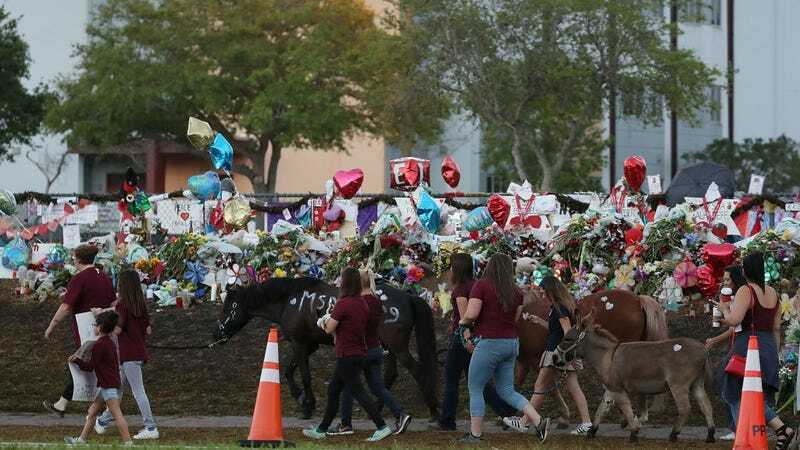 It’s been two weeks since the mass shooting in Parkland, Florida claimed 17 lives and the surviving students of Marjory Stoneman Douglas High School returned to class on Monday. They’re doing everything in their power—speaking at other high schools and brutally owning Alex Jones—to ensure that similarly ghoulish acts of gun violence don’t occur in our nation’s schools, and that’s worth celebrating. Musicians, too, have lent a hand in days since the Parkland tragedy, some inviting students and teachers to their shows. It’s not much, but it feels like a step in the right direction. Demi Lovato brought some Stoneman Douglas students onstage at her tour opener in San Diego on Monday night, to share their story and help raise money for the CAST Foundation, a mental health awareness organization that’s offering free counseling on her current tour. Dead & Company, the Grateful Dead project featuring John Mayer and his guitar face, wore MSDStrong shirts during their recent show in Florida, and invited students and teachers backstage after the gig. Separately, Emilie Smith, who attends a nearby high school, is working to organize a benefit concert for Parkland victims and their families with a stacked wish list: Paramore, Camila Cabello, Fifth Harmony (ideally performing hours before or after Camila), Khalid, Lana Del Rey, and many more. Fifth Harmony’s people and Hayley Williams of Paramore have apparently been working out scheduling, and it sounds like the thing’s coming together in some capacity, with rising pop rock group The Aces and Langhorne Slim checked off her list as performers.